Hi, remember us? Yeah, I know it's been awhile. It's been a heck of a month or so at Chez A Good Appetite. I'm still having a hard time doing much cooking due to an injured wrist, but hopefully surgery in two weeks will take care of the problem. That will be just in time for farmers market season to start and reinvigorate our kitchen creativity. So, give us a bit more time and we'll be back with more recipes. In the meantime, here's a take on mushroom risotto Matt came up with. Usually, I slice the mushrooms for risotto, but he wanted to finely chop them to infuse the flavor throughout. It makes for a dish that is full of umami. The peas add the perfect contrast of sweetness. Pulse the mushrooms in a food processor until they are roughly chopped. Heat 1/2 tablespoon of olive oil in a skillet over medium-high heat. Add the mushrooms. Season with a pinch of salt and a few grinds of pepper. Sauté until the mushrooms are tender and have released most of their liquid. Add the peas and sauté until they are warm. Put the stock in a pot and bring to a simmer. Keep simmering throughout the cooking process. In a large saucepan, heat the olive oil and butter over medium heat. Add the leeks and sauté until tender. Add the rice and stir for about 1 minute. Stir in the wine. Let it cook, stirring occasionally, until absorbed. If it appears to be cooking above a simmer turn the heat down. Add the stock about 1/2 cup at a time, adding each addition as the one before is absorbed. You don't need to stir constantly, but keep a good eye on it. The rice should be tender and creamy, but with just a little bite, by the time you have one addition of the stock left. Add the final addition of stock and the mushroom and pea mixture to the rice. Heat until warmed through. Stir in the cheese. Taste and season with salt and pepper as needed. That's a good-looking risotto! Hope the surgery is successful. I was just having a moment of missing seeing you around on the twitters and whatnot. And had to come over and visit your site mid-workday. So sorry to hear about your injured wrist! I hope surgery fixes it all up and that you'll be back in action soon! Hugs! 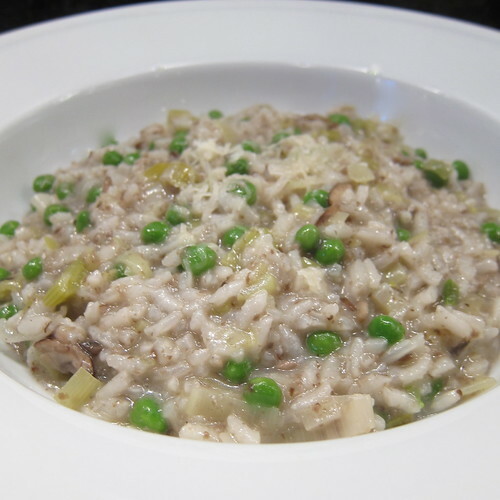 This mushroom pea risotto looks so comforting, especially on a foggy day like the one we have here. I hope your surgery and recovery goes well. I have to get my wrist checked out too. I'm hoping to avoid surgery. So sorry to hear about your wrist. I hope the surgery goes well. The risotto looks great! A cup is 8 oz, so it should be easy to figure out from there... 1/2 c = 4 oz, 3/4 c = 6 oz. Hope that helps.